Electronic message boards are now commonly used in offices, stores, malls, theaters, corporate firms, and sometimes homes. Scrolling messages are very catchy and therefore are used to inform people of something very important or to get their attention. Now you can own your own LED digital billboard. 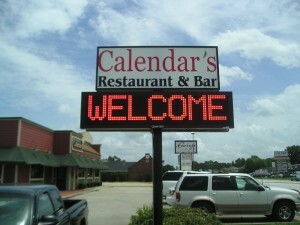 Greater Baton Rouge Signs supplies LED electronic message boards in a wide range of sizes with full features to suit your needs. Electronic message boards are available for indoor signs, outdoor signs, window display, video display, rate display, and graphic display. The electronic message boards supplied by us are very user-friendly.just plug in and input what message you would like to display, and you’re done! Electronic message boards can help you in countless ways. A few are described below. If you are a restaurant owner, you can display the favorite dishes or inform customers about the specials of the day. If you are a retail storeowner, you can display items on sale, special discounts, or free gifts with purchases. The name of your Web site can also be displayed so that customers can visit it and know what items are being sold at your stores, how to contact customer service, etc. If you are a dealer in foreign currency exchange or a travel agent, your electronic message boards can be programmed to display the latest foreign exchange rates of leading world currencies, fares for various destinations with discounts, and so on. If you wish to display important notices, news, or holiday wishes, you can use electronic message boards. High quality of display to broadcast information clearly. Availability of various sizes and resolutions to suit your needs. Well-educated and experienced sales staff to guide you through buying the most suitable and appropriate electronic message board. A top-notch technical staff for after-sales service, who will promptly attend to your call and take action immediately. A bold scrolling statement on an electronic message board will serve the purpose of driving attention. Changing the content of your messages has been made even easier. Electronic message boards are very useful, cost-effective tools for conveying your messages to the masses. 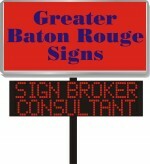 Greater Baton Rouge Signs is an authorized dealer/wholesaler for several electronic message board manufacturers.